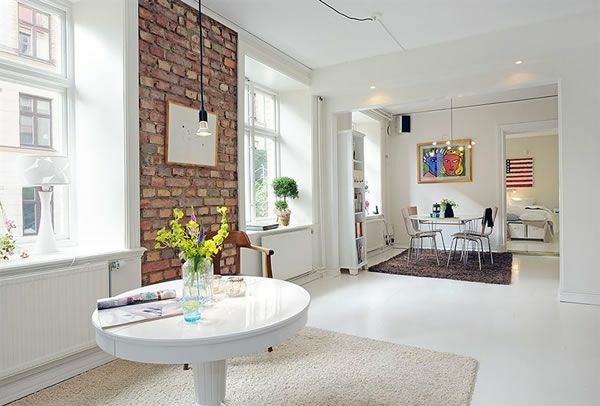 Welcoming inhabitants with an irregularly shaped hallway, this 54 square meters condo in Gothenburg is suited for someone who loves cozy, interestingly shaped residential spaces. The versatile apartment offers social and resting spaces in the same bright room, while the kitchen was designed to display a welcoming design. The living room is used as both the bedroom and the entertainment room, and the small walk-in closet with mirrored doors and the pantry occupying a corner of the kitchen offer plenty of storage space. Windows facing both east and west flood the spaces with natural light bouncing off white walls and wallpapered kitchen wall. Three meter high ceilings offer the possibility of building a loft to shelter the bed and offer an interesting twist to the versatile space. The hallway opens to a small, unusually shaped bathroom with natural stone floors, with walls partly covered in white tiles. Spotted on Alvhem, the charming condominium features the original hardwood floors, a detail that offers elegance enhanced by the use of a playful, vividly colored wallpaper in the kitchen. If this would be your next home, how would you transform the space to suit your own needs?